Enjoy drinks, tours, and tastings at craft drinking hot spots in Williamsburg, Virginia! 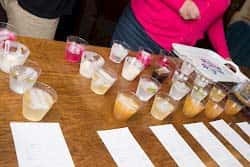 Let our 14-person bus take you out for drinks, tours, and tastings at four of Williamsburg's alcohol and drink producers. Drinks, tours, and tastings are included in the $69/person ticket price for the Drink Williamsburg Experience, offered at 1pm and 5:30pm. Our alcohol adventures are great for single riders, groups, and private parties. See the Itinerary for more information. We now offer winery tours to three of the region's wineries on Sundays, Mondays, Wednesdays, and Thursdays. Please see our winery tour page for more. 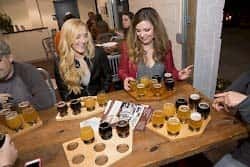 In addition to its other attractions, Williamsburg has breweries, distilleries, wineries, and even a meadery only steps away from Colonial Williamsburg, that produce some of the finest adult beverages this side of the Mississippi! What better way to experience tours and tastings at these delicious establishments than Drink Williamsburg, which eliminates pesky issues, like having to find a driver and fight through a crowd to get a drink. Instead, meet new and exciting people while enjoying the alcoholic pleasures Williamsburg has to offer. Our starting location, King of Clubs Brewing Company, features a cupping session of freshly roasted coffee and tasting flight experience of nitro cold brew coffee, kombucha, and jun. Book a single ticket, book your group or rent an entire bus for a private party. You can pick the locations on custom tours, and we do the rest. Sit back, relax, and have a drink. For those who like to change it up, we also have a monthly rotation of guest breweries, food pairings, and special events. Book now, space is limited and slots fill up fast! All tours are great for single riders, as the Drink Bus usually turns into a mixer and a great way to meet new and fun people. Drink Williamsburg is also ideal for group and private tours. Drink, tour, and taste at Williamsburg's craft breweries, distilleries, and meadery! 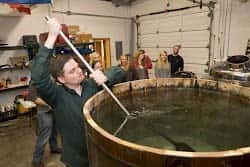 Drink Williamsburg operates daily, offering both day and evening tours, and private parties to alcohol producers in Williamsburg, Virginia. The four locations we will visit produce many variations of beer, rum, gin, whiskey, and mead. You'll get to drink it all, but you'll also learn how each type of alcohol is made, and the stories behind them. Each establishment is unique. One distillery practices the Scottish tradition of whiskey making, while the other focuses on the Colonial method of distilling. Did you know that the first bourbon was distilled in Colonial Virginia in the 18th century? On our Drink Williamsburg Experience, you'll see one of the only two places that distills in authentic Colonial Style. Our tour guides and drivers will take you there, and introduce you to it all! Our comfortable 14-passenger bus offers a fun and convenient way to experience Williamsburg's breweries, distilleries, and meadery responsibly. We offer free pickup and drop-off for groups of five or more within three miles of downtown Williamsburg, and can pick up outside of this range for a small fee (click here for details). The bus features wood floors, a cooler where you can store your growlers and custom storage space for any food you decide to bring along. Drink Williamsburg is perfect for your next private event. We offer both private and custom tours. My husband and I were the only two on the tour but he made it a great experience! This trip is highly recommended! Every tasty drink was unique as the place we tried them at. We were driven by Brian who was fun as hell and kept us safe and informed. We had a great time. I'm very happy that we paid the extra to be picked up from the hotel. Alfonse was a great tour guide. View the Drink Williamsburg Tour Bus!